The Poetry of Katherine Fowler Philips, once known as "The Matchless Orinda"
[A note to the reader: the following essay was written in 1985; it was published in Philological Quarterly, 66 (1987), as "Orinda, Rosania, Lucasia et aliae: Towards a New Edition of the Works of Katherine Philips," pp. 325-54. I have updated the texts by comparing the edition I used with the texts from the recent edition of Katherine Philips's works by Patrick Thomas, which is based on manuscripts, but follows the same politicized arrangement favored by Cotterell; whenever I quote any of Philips's lines I cite Thomas's pagination; when there was a discrepancy between the orthography or wording of Saintsbury and Thomas's texts, I have preferred Thomas's. I have added the poems he found to my listing. I have also updated the endnotes and bibliography. I put this essay on the Net to make the information and texts contained in it readily available. I also note that in Thomas's edition for Stump Cross Press, Thomas simply edited the manuscript and followed the order we find in Cotterell. Thus his edition leaves Katherine Philips's poetry with the same skewed emphasis and disorder that Saintsbury's reprint of Cotterell left it. Thomas substitutes a much better text than Saintsbury's or Cotterell's; he prefaces the texts with a description of the manuscripts and other printed books where the poems may be found; he includes informative notes; but without a comprehensible order, the poetry remains opaque to a reader who is not impeccably versed in her life history. There are other contemporary arrangements which he could have followed; for example, one found in manuscript 775b in the National Library of Wales, and printed in Carol Barash's English Women's Poetry, 1649-1714 (Oxford: Clarendon Press, 1996), 291-98. Speaking generally, in this manuscript the private autobiographical poems come first, with the moral poems coming in gradually. The political poems are sandwiched in before the very end where the moral/religious predominate over the personal/autobiographical poems. I also reprint (Thomas does not) Katherine's translation of a pastoral "Golden Age" poem, "La Solitude" by Antoine Girard Saint-Amant (1594-1661) as "Solitude". It is the purpose of this essay to propose a chronological (and illuminating) order for the original poems of Katherine Fowler Philips (1631-1664), or, as she chose to call herself, Orinda, This ordering will enable us better to understand Philips's poems, and I will use the contexts suggested for the poems to discuss the personal meaning and aesthetic merit of them, which have been obscured because we are even now [that is, in 1987 when the essay was published] still reading a reprint of the posthumous 1667 edition. Here, first is a brief history of the significant publications of all Orinda's work. In 1651 her tribute to William Cartwright's "Stay, Prince of Phansie, stay, we are not fit," was prefixed to a posthumous edition of Cartwright's plays and poems.1. "Friendship's Mystery, To my dearest Lucasia" (Anne Lewis Owen, later Trevor, Lady Dungannon) appeared in Henry Lawes's Second Book of Ayres and Dialogues (1655). The year 1663 saw two editions of Philips's translation of Corneille, Pompey. A Tragedy. In 1664 a pirated edition of seventy-four poems was printed; Katherine Philips anathematized this book and succeeded in suppressing it. She died of smallpox in this year. It is my contention that the Cotterell-Saintsbury book leaves any reader who does not otherwise know Katherine Philips with a distorted and unfavorable impression of her. It is obvious from the text that she never did make any move towards a professional or authorized edition of her work. Many of them were written for a few chosen friends, and part of their meaning therefore remains enigmatic. Moreover, her poems are not printed in any kind of planned sequence. Their chronology is utterly jumbled; poems which clearly belong together -- because they are written to or about one person or group of friends, and if brought together would illuminate one another -- are widely dispersed. Poems written in a favorite genre of Orinda's, the moral verse essay, alternate with occasional and lyric poems, written during very different periods in her life, in heterogeneous moods and places, and for differing motives. A semblance of order is provided by Cotterell, but it is a semblance, nothing more, and it reflects the attitudes and needs of Cotterell, which were not identical with those of Katherine Philips. It is appropriate to note that a careful reader of these encomiastic Stuart poems will discover many dissonant passages of lament, dejection, and pessimism. Katherine Philips writes elegies on the deaths of Henry, Duke of Gloucester, and Elizabeth of Bohemia (Cotterell's supporting patroness), where she locates their value for us in their histories of continual loss and their indifference to Fortune and material reward (Saintsbury, Nos. 8 and 10, pp. 512-13, 514-15; Thomas, Collected Works, I78-79; 81; since Thomas's numbers are those of Saintsbury I do not repeat them). Two Poems do not fit into Cotterell's Restoration parade at all. In "On the 3rd September 1651" and "Upon the double Murther of K. Charles in answer to a libellous rime made by Vavasour Powell" (Saintsbury, Nos. 11 and 1, pp. 515 and 507, Thomas, Collected Works, I:69-70; I:82), the first written in 1651, the second 1653, Katherine wrote private poems for herself. Her meditation on the Stuart defeat at Worcester recalls James Shirley's dirge, "The glories of our blood and state".13 It is a lament of the heart, crying out that no-one can win anything valuable or permanent, in the material world: "Who'd trust to Greatness now, whose food is ayre/Whose ruine sudden, and whose end despaire?" The second is no party poem either. Katherine condemns both sides in sarcastic antithetical couplets "Great Charles his double misery was this,/Unfaithfull friends, ignoble enemies." She composes into a terse polished couplet the horrors of the religious war around her thus: "Christ will be King, but I ne'er understood/His subjects built His Kingdom up with blood." She asks with sharp frank sarcasm "What noble eye could see, (and careless passe)/The dying Lion kick'd by every ase?" There is the quiet questions can Charles not have "A quiet crowne, nor yet a quiet grave?/Tombes have been sanctuaryes."  As having their own peace betray'd. see also Thomas, Collected Works, I:98). Orinda lives for readers today in this kind of statement. Francis Finch had given Katherine's emotional friendships with Anne Lewis Owen Trevor (Lucasia) and Mary Aubrey Montagu (Rosania) a poetic justification and disguised language by reifying informal irregular gatherings of men and women friends into a neoplatonic English salon;18 We can date Katherine's addiction to poetic names just around the time of Finch's way of accounting for Katherine's intense emotional attachments to female friends. The Cotterell-Saintsbury text displaces Orinda's poetic delineations of her romantic friendships with women. These seventy-one poems include her finest and most numerous poems; and these occur higgledy-piggledy in the volume from the twelfth through the penultimate of the original poems. My re-ordering will restore the strongest passion driving Orinda to write poetry to its central place in her canon. However, equally characteristic of Orinda are poems of apology, discouragement, humiliations, estrangements and despair. Due to the disorder of Philips's poems to a number of women, these poems are not understood and hence their force and thought unrecognized. Only the women whom Katherine Philips knew for a shorter times or met later in life, or demanded less devotion from, remained faithful and receptive. These are the so-called "minor" women, e.g., Pastora and Phillis, as yet unidentified, and Philoclea (Mrs M. Stedman); then we have Ardelia (Mary Aubrey Harvey, Lady Dering), Celimena (Lady Elizabeth Boyle Tufton, Countess of Thanet), and Valeria (Lady Anne Boyle Montague, later Lady Sandwich). Katherine's earlier companions who became obsessions with her lapsed into embarrassment and perplexity, were naturally unfaithful and at long last shifted to anger and studied coolness. Regina Collier was given no poetic name as her and Katherine's period of deep camaraderie occurred in Katherine's father's house, before the supposed regular poetic circle formed. Regina Collier, Mary Aubrey Montagu (Rosania), and Anne Lewis Owen Trevor (Lucasia) all eventually rejected the exclusive devotion and overt courtship Orinda, lavished on theme with an understandable desire for independence and automony. They shut her out with husbands, new friendships, other interests. In response, she nagged them with uncomfortable poems of restrained discord and at moments near-derangement. Your Pleasure which its elf destroies. And make Shackles which they wear. Makes his own Idols and then worships it. Two bodyes and one minde? That she can vary every heart? And by the rest forgot? Value, not number, makes the price." In memory of F. P. who dyed at Acton 24 May. 1660 -- 13th of her age"
Another deep and loving relationship with a woman, a young one, a daughter, is recorded here. The closing lines recall or are modelled on Henry King's moving "Exequy. To His Matchlesse never to be forgotten friend", his wife, one of many instances of Katherine's continual close affinities to metaphysical/Cavalier poetry (see Helen Gardner, ed., The Metaphysical Poets [New York: Penguin, 1972, pp. 112-13). Therefore, fit in Heav'n to dwell. If we were reading Orinda's poems to Antenor as a group, one would not have to assert that Katherine Philips was a serious companion to her husband, and that she was much more steadily involved in the political realities of her time than any reified poetical salon. But the reader now and still in Thomas's edition must wait until the end of a scattered disordered series of poems to get to this one, to her poems to her children and must turn to political history of the period to understand that last line. It's also worth pointing out that Katherine understands one of the central motives of many suicides: shame. The individual is caught between choices, none of which are felt bearable, all of which must be taken up before a private and wider public. She is not usually spoken of as a woman with this kind of understanding. Yet is so ignorant at home! We hardly get, and darkly see. My suggestions for a fourth and fifth grouping for an adequate arrangement in an edition of Philips's poems would group those poems which share "a tone of distant formality." 27 The fourth group would be comprised of Philips's poems to her men friends. They form a distinct group because in them she equates her interlocutor with a coherent cluster of ideals and uses the individual man as an imagined figure around whom she can meditate these ideals. Since in six of the ten poems, it is an aesthetic ideology which she is intent upon, her poetic doctrine emerges. Read chronologically, we can map an individual instance of the profound change in taste which occurred in England from around 1640 to 1660. Again a kind of excellence in Orinda's works which is rarely anthologized28 will emerge. A strong strain of antifeminism is discernible in editors' dismissal (in effect) of Orinda as solely a sentimental lover of women, or (by some) more pejoratively, a curious example of unconscious lesbianism.29 Antifeminism is also responsible for the reluctance of scholars to admit that Mrs. Philips was friends with, and respected by Henry Vaughan, Henry Lawes, Abraham Cowley, and Jeremy Taylor and other men of letters, not to omit men of wealth and power like James Butlers Duke of Ormonde. The evidence is thick on the ground in many books. In his introduction to Philips's poetry, Cotterell wanted us to grasp that this startling truth was incontrovertible. In their tributes to her, Roger Boyle, Earl of Orrery, and Wentworth Dillon, Earl of Roscommon insist on her unusual fame and the irresistible high quality of her work (Saintsbury, Commendatory Poems pp. 493-95) .30 Katherine was not by her generation relegated to a corner where women write poetry to one another. Again, the note that "there's no pleasure but in serious things" is one as characteristic of Katherine Philips in the deepest sense as her famous poems of ecstatic friendship to Lucasia. She was highly learned in the philosophy and history of her period as well as supremely well- read. This too is as yet overoverlooked. The fifth, final and last grouping of Philips's poems should include the conventionalized and politicized Stuart poems discussed above, poems with which Cotterell opened his volume, Saintsbury his reprint of Cotterell, and with which Thomas has decided to open his as well. If we read the poems of Katherine Philips in the order proposed they make sense, and reveal an interesting appealing woman who was an able poet in her time. Equally to the point, a reading of the poems in an appropriate order would do much to end the use contemporary feminist scholars have been inclined to make of Philips as a whipping "girl." In the writing of many she is still a modest politic paragon who with a conventional group of exemplary poems gave later women a stultifying model. It is implied that she was a hypocrite to boot.33. It did not seem so to Anne Finch. Katherine Philips was an atypical, highly learned woman whose intense attachments to other women led her into writing a group of extraordinary poems. We might here ask why this attachment? We can only surmize that forced into marriage with a man so much older than she, one who did not share her interests in learning, brought up in a world which insisted in the sacred importance of female chastity, she turned to other women with whom as a person she felt safe, comfortable and could find a deep validation of her sense of individual self. She knew she was an anomaly. She knew other people did not have this need for sincere intense companionship so she took over for herself the poetic idealized world of friends that others like to play with. She took seriously what was for others a game. With these idealisations and her love for her family and her imagination she dwelt in private communings as she wrote. She never marketed any public image of herself at all, and, if we blame her for this, we are anachronistic. We demand of her what we don't demand of ourselves: a breaking away from contemporary conventions. Orinda would call us worldly fools. It is again suggested that "a new edition of the poems of Katherine Philips is one of the pressing needs for seventeenth-century scholarship." It is also suggested that such an edition should re-order the poems so as to do justice to Katherine Philips at last. A Proposed ordering of the Original Poems of Katherine Philips (with conjectural dates and commentary) for a new Edition of her Works. Note added in 2002: the reader may use these explications and information if he or she has Thomas's edition, for Thomas has used the same misorder and numbering that we find in Saintsbury. I have corrected the titles I found in Saintsbury in accordance with Thomas's edition; I have added to Saintsbury all poems hitherto scattered in recent publications (see above). A. Poems to Rosania - Mrs. Mary Aubrey Montagu. 1. No. 34, p. 534. "19. Septemb. Rosania shadoww'd whilst Mrs M. Awbrey. 1651" ca. 1648-50. Very early in relationship, Katherine has not given her the idealizing name; end-stopped couplets. Diffident tone. 2. No. 50, P. 548, "To Mrs. Mary Aubrey (set by Mr Henry Law's)." 1664 ed. entitled "L'Amiti�.1' ca. 1648-50. Internal references to "factious World, "King," and "conquerors"; French influence Mme. de la Suze. Sustains ineffable quality of achieved sublime love. 3. No. 49, p. 548. "To Mrs. M.A. upon Absence (set by Mr Henry Law's)." ca. 1648-50. Before-ideal name; Donnian dramatic images and syntax in lyrical stanzas. Katherine in Wales enduring four-month separation. 4. No. 53, pp. 550-51. "To Mrs. Mary Awbey. at parting." ca. 1651. Ideal name at end of poem; rhythm impressed Keats, and it is an anthology favorite. 5. No. 66, pp. 564-65. "Invitation to the Country." ca. 1651-52. Poem of painful self- accusation. Orinda in Wales, tries to persuade Rosania to join retreat where "all be empty, wild and like to me." 6. No. 84, p. 579. "A Farwell to Rosania." ca. 1651-52. Six-line plea to Rosania to remember Orinda's "mourning heart," to be kind and to return. 8. No. 42, pp. 540-41. "To Rosania (now Mrs. Mountague), being with he, 25th September. 1652." 1652. Echoes Donne ("As men that are with visions graced"). Poignant plea for pardon for her "follies;" Rosanials "estrangement" adds "new ruin" to Orinda's "heart." 9, No. 68, p. 566, "On Rosania's Apostacy, and Lucasia's Friendship." 1652. Orinda switches allegiance. All later poems to Rosania are also to Lucasia except for the next poem. 10. No. 38, pp. 538-39. "Injuria amici" 1652. eglected startlingly unreserved poem to "apostate" in simple passionate speech: "And you kill'd me because I worshipped you." A compound of self-abnegation, submission utter vulnerability. Rosania humiliated Orinda in in public in some unspecified way, but, in response, Orinda will "make my heart a scornd prostitute." Final octosyllabic couplet shows a striking enthrallment and suppliant image: "I'll adore the author of my death/And kiss the hand that robs me of my breath." B. Poems to Lucasia - Anne Lewis Owen Trevor, Lady Dungannon. 1. No. 26, pp. 526-27. "To the truly noble, and obleiging Mrs: Anne Owen (on my first approaches)" ca. 1650. Very early in relationship; Katherine has not given Anne the idealizing name. Subdued formal address; much self-disparagement and gratitude: "There is no honor got in gaining me." 2. No. 25, P. 526. "To the excellent Mrs. A. O. upon her receiving the Name of Lucasia, and adoption into our Society, 26 Decemb, 1651." Influenced by Donne's visionary lyrics; ecstacy; they are numinous and absorb all good into themselves. 3. No. 16, pp. 519-20. "A sea voyage from Tenby to Bristol, 5 of September 1652, Sent [from Bristol] to Lucasia, 8th September 1652" Humorous poem of highly-pictorial conceits. Artful variation of rhythm in couplets. 4. No. 17, p. 520. "Friendship's Mysterys, to my dearest Lucasia (set by Mr H. Lawes.)." ca. 1652-54. Donntan lyric of ecstatic bliss. Another anthology favorite. 5. No. 18, pp. 520-21, "Content, to my dearest Lucasia" ca. 1652-54. Donnian influence upon argument defining what is content. Mood blissful. 6. No. 27, pp. 527-28. "Lucasia." ca. 1652-54. Golden Age poem; Lucasia Virtue itself, and should be canonized. 7. No. 28, pp. 528-29. "Wiston Vault." ca. 1652-54. Emblematic idea in poem of smooth couplets. Reverie upon burial place of Katherine's husband's forebears in Cardigan. Lines show it to be another to Lucasia: "after death too, I would be alive,/And shall, if my Lucasia doe, survive. 9. No. 36, pp. 537-38. "To my Excellent Lucasia, on our friendship, 17th July 1651," ca. 1652-54. Ecstatic (quoted above in full). 10. No. 46, pp. 546. "Parting with Lucasia, 3th Janury 1657/8. A song." Orinda overcomes reluctance to leave Lucasia; much neoplatonic doctrine. 11. No. 19, p. 522. "Set by Mr H. Lawes/A Dialogue [of Absence] twixt Lucasia and Orinda. ca. later 1650s. Antiphonal song for London poetic circle; she again remembers Donne; Orinda cannot accept bodily separation from Lucasia; their souls are not enough. Intense seriousness. 12. No. 80, p. 577. "A Dialogue betwixt Lucasia and Rosania, imitating that of gentle Thyrsis." ca. later 1650s. Companion poem to above; another antiphonal song of simple words and lyric grace. Thyrsis is Henry Lawes. Rosania argues Lucasia must leave flocks and come to town. Lucasia fears her "world" would be "severe/Should I leave them to go thither." 14. No. 112, pp. 596-97. "Parting with a Friend." ca. later 1650s. After above poem; triumvirate has had "forty weeks' converse." Again Orinda urges two women to be true, this time by "Letters as kind and undisguised as thought." 15. No. 57, pp. 552-53. "Friendship." ca. later 1650s. Initiates series of discourses on friendship to her "true friend." In March 1654 Finch sent his letter on friendship to Lucasia; the "society" now engaged seriously with ethics of friendship.38 Orinda's style changing; verses smooth, simple, intendedly sweets recalling Waller, e.g., the friends are "As saints in visions; quiet as the night,/But cleare and open as the summer's light." Very pleasing poem. 16. No. 64, pp. 561-65. "A Friend." ca. later 1650s. Continuation of above; defines ethics of friendship. Anger at men for excluding women from a complex ideal relationship. 17. No. 97, p. 588. "A Dialogue of Friendship multiplyed." ca. later 1650s. Musidorus not identified. Katherine may be alluding to Philip Sidney's Arcadia; Musidorus is one the two heroes. Orinda justifies her exclusive love for Lucasia. 19. No. 32, pp. 533-35. "To (the truly competent Judge of Honour), Lucasia, upon a scandalous Libel made by J.Jones." 1655. Colonel John Jones, regicide slandered Orinda for her familiarity with Royalists. Defines honor; a visionary retreat to private world. 20. No. 59, pp. 554-56. "To my Lucasia, in defence of declared friendship" ca. 1656-59. Relationship between two women changed after the death of Anne Owen's husband. Another discourse upon friendship, but now a plea, a self-vindication, resisting Lucasia's opinion that Orinda's overt reiterated courting of her is"impertinent." Lucasia accused Orinda of "distrust"; Orinda asks Lucasia her to be kind. 21. No. 58, Pp. 553-54. "The Enquiry." Ca. 1656-59. Return to Donntan intellectual stanzas; poem of deep hurt (quoted above). Lucasia alien and "cruel." 22. No. 43, p. 54.. "To my Lucasia," ca. 1656-59. A desperate apology for her need for outward signs of their friendship; asks Lucasia not to "quit" here, to "add some patience" to her many virtues. 23. No. 98, pp. 588-89. "Rosania to Lucasia on her Letter." ca. 1656-59. Orinda uses Rosania to accuse Lucasia of "rigid policy" in her letters. She hints that Lucasia is really contemptuous of neoplatonism. 24. No. 108, p. 594. "An Answer to another persuading a Lady to Marriage" ca. 1660. Forceful apostrophe to Marcus Trevor ("bold youth") then wooing Lucasia (who appears as Calanthe in the letters between Poliarchus and Orinda). This was a period of bitter discord; Orinda wants Lucasia to marry Cotterell and in this poem insults the relatively unpretentious Trevor.40 Lucasia is "a public Deity" and Trevor's courtship of her is a sacrilegel: "were't not very odd/She should depose herself to be/A petty household god." Other poems suggest that Anne Owen (Lucasia) became indignant at Katherine's interference. 25. No. 111, P. 596. "To Mr. Sam Cooper, having taken Lucasia's Picture, given December 14. 1660" Dactyllic triplets create mood of light elevation in which, as Orinda delights in Cooper's painting, she praises art in the "la belle nature" mod or ideal of art. 26. No. 113, pp. 597-98, "To my dearest Friend, upon her shunning Grandeur.' 1661. Octosyllabic smooth couplets convoluted apostrophe in which Orinda urges Lucasia to embrace "titles" to show that they will not corrupt her. This is a veiled attempt to persuade Lucasia-Calanthe to marry Poliarchus (Cotterell). That they may find recuits of spirits there. Openly murmur, and demand the day. Thy absence makes my night. 29. No. 79, p. 577. "Song. To the Tune of Sommes nous pas trop heureux." ca. 1661-62. Companion piece to above. Orinda refers to "dying" from love's "quiver" and to "the sad unusual story/How my wretched heart was torn." She expresses the confusion she feels upon the shattering of her vision of Lucasia. 31. No. 100, pp. 589-90. "A Triton to Lucasia going to Sea, shortly after the Queen's arrival." May-June 1662. Four-stanza Pindaric ode of basically dactyllic couplets of varying length; this poem compares interestingly with "A sea voyage from Tenby to Bristol, 5 of September 1652, Sent [from Bristol] to Lucasia" (No. B.3 above). Both humorous, gracious compliments to Lucasia, the earlier in the conceited Cavalier style, the later in the broader metaphoric prosaic style of Cowley. 32. No. 83, P. 579. "Lucasia, Rosania and Orinda, parting at a Fountain, July 1663." One of Orinda's best poems; Katherine's use of myth recalls Marvel; her versification, Waller. Her two (now cold) friends are like the fountain nymphs; she brings wine to revive them and the spring. Great sadness -- it is harder to forget than to meet, hard as it is to meet. Another anthology favorite. 1. No. 62, pp. 559-561, "In Memory of the most justly Honoured, Mrs. Owen of Orielton." Mother of Lucasia's father-in-law and step-father has died February 1653. A verse character in the idealizing later 17th centuryFrench tradition; Orinda advises Lucasia not to grieve but pxofit by ideal example. 2. Elmen, "Epitaph on Mr John Lloyd," July 1656.43. Thomas, Collected Works, I:248, prints this as "Epitaph on Mr John Lloyd of Kilrhewy in Penbrokeshire (who dy'd July the 11th 1657), inscrib'd on his Monument in Kilgarron (in the person of his wife). Eulogy on one of Lucasia's relatives (Lucasia's mother was Katherine Lloyd),44. 3. No. 31, pp. 531-33. "In memory of that excellent Person Mrs. Mary Lloyd of Bodidrist in Denbighshire, who dy'd the 13th of November, soon after she came thither from Penbrokeshire." Lucasia's maternal grandmother; another idealized verse character, this one intended to give Lucasia "a Queen" of virtue in her heritage. 4. No. 105, pp. 592-93. "On the Death of the truly honourable Sir Walter Lloyd Knight." 1660-1661. Elegy in the form of an idealized verse character; Sir Walter is praised for his "loyalty" to "arts and Virtues" and to the Stuarts during dangerous civil war. C. Poems to Regina - Regina Collier. Regina was the wife of Katherine. Philips's father's servant and cousin, John Collier; there are no poems from the period of their romantic young-girl companionship extant before 1647. 1. No. 35, P. 537. "To the Queen of inconstancie, Regina Collier. in Antwerp." ca. 1649-50. Brilliant virulent poem of intense hatred (discussed above). 2. No. 39, pp. 539-40. "To Regina Collier. on her cruelty to Philaster." ca. 1653-54. Another vitriolic curse (discussed above). Philasters was Col. John Jeffries. Internal reference to successful Commonwealth: "You I see are lately Round-head grown,/And whom you vanquish you insult upon." 3. No. 40, p. 40. "To J. J. esq: [Philaster], on his Melancholy for Regina." ca. 1653-54. Four-line postscript to above poeml brief solace. C (l). Poems for Regina's family. 1. No. 55, p. 552. "Engraved on Mr. John Collyer's Tomb:stone at Bedlington." 1649. Epitaph on Regina's husband. 2. No. 56, p. 552. "On Little Regina Collyer, on the same tombstone." 1649. Mourning death of Regina's baby. 1. No. 22, p. 524. --A retir'd Friendship. To Ardelia. 23 Augo 1651" Horatian ode of calm friendship rather than awed vision of love (discussed above). Well-known poem. E. Poems to Philoclea - Mrs M. Stedman, a Welshwoman friend from Katherine Philips's earliest poetic period (1649-50); Mrs Mallet Stedman's sister-in-law married Katlierine's husband's brother. 1. No. 41, p 54. "Philoclea's parting. Feb: 25, 1650". The 1664 also dated the poem. This is a brief series of coquettish couplets. Rosani'ls "silence" had made Orinda the "wretched'st martyr". Now Philoclea has comforted Orinda, but only to increase her "torment" by also parting. F. Poem to Lady Alice Egerton Vaughan, Countess of Carbery. In the extant corpus Katherine doesn't give this woman a poetic name. She was second wife to Richard Vaughan, Lord Carbery, a powerful Cardigan royalist, patron of Jeremy Taylor; Lady Alice has a tiny fame among Milton and 17th century poetry and masque specialists as it was she who played the "Lady" in Milton's Comus. 1. No. 13, pp. 516-17. "To the Right Honourable Alice Countess of Carbery, on her enriching ["at her coming" in Saintsburgy] into Wales." ca. 1654-55. 46 Formal first approach to "shrine" of Lady Alice; public panegyric on an educated woman who belonged to an important local family and could bring art and culture to Wales. Katherine humble yet trying to make friends. G. Poems to Celmina - Lady Elizabeth Boyle Tufton, Countess of Thanet. Lady Elizabeth belonged to the powerful and intellectually-gifted Anglo-Irish Boyle family, two of whose male-members, Roger Boyle, Earl of Orrery, and Wentworth Dillon, Earl of Roscommong were responsible for the staging of Philips's translated play, Pompey, in the Smock Alley theater in Dublin, Ireland, February 1663. 1. No. 102, P. 591. "To the Lady E. Boyle." November-March 1662-63. Dactyllic lyrical stanzas, style plain-spoken, yet mood tender. Another first approach. Katherine speaks of "love" (not neoplatonic friendship), and tells Lady Elizabeth that her heart is "fearful" because "it has been by tenderness/Already so much bruis'd." 2. No. 69, p. 567. "To my Lady Elizabeth Boyle, Singing, Since affairs of the state, &c." November-March 1662-63. Dactyllic song with feminine endings; syntax that of normal conversation; Waller-like melody. Katherine "vanquished" by Lady Elizabeth's "voice." 3. No. 107, p. 594. "To Celimena." November-March 1662-63. Brief passionate poem (four heroic couplets) which recalls poems of ecstacy to Rosania or to Lucasia. Orinda accosts her heart, but this time warns it to "forbear" "tormenting" Celimena. Katherine is by now aware that if she presses too hard on an intimacy, she will be rejected, and her vision shattered once more. H. Poems to Valeria - Lady Anne Boyle Montagu, later Lady Sandwich. Lady Anne was Lady Elizabeth or Celimena's sister. 1. No. 85, pp. 579-80. "To my Lady Ann Boyle's saying I look'd angrily upon her," November-March 1662-63. Witty couplet poem; "one of Orinda's best pieces of ingenuity. "48 She is "obliged" to Valeria for being jealous of Celimena, for it "shows your kindness, though it questions mine." H (1). Poems to Celimena's and Valeria's family. 1. No. 45, pp. 543-46. "To the Rt Hono: the Lady E.C." Fall 1662 Ireland. Elizabeth Clifford Boyle, Lady Cork, mother to Celimena and Valeria; she was Katherine's genuine friend. This idealized verse character commemorates the encouragement Lady Cork gave to Katherine as a poet. 2. No. 104, P. 592. "To the Countess of Roscommon, with a copy of Pompey." Spring 1663, Ireland. Lady Francis Boyle Dillon, sister to Celimena and Valeria, Roscommon's wife. Katherine asks the Countess to support the play. 3. No. 89, pp. 582-83. "On the Death of my Lord Rich, Only Son to the Earl of Warwick, who dy'd of the Small Pox, 1664. Poignant elegy; Katherine could have known the desolated mother, the literary Lady Mary Boyle Rich,Countess of Warwick, aunt to Celimena and Valeria.49 An occasion to mourn the uncertainty and ravages of life; she enters into the parents' anguish; she recalls her step-daughter's death. I. Poems to Pastora and Phillis - unidentified women from Katherine's later poetic period (1662-63). 1. No. 114, p. 598, "To Pastora being with her Friend." ca. 1662-63. Dated by prosaic easy style and absence of neoplatonism; as with Boyle women, Katherine speaks in ordinary human terms. Pastora's joyful friendship with another woman restores "withered" Orinda's belief in friendship. 2. No. 109, pp. 594-95. "Lucasia and Orinda parting with Pastora and Phillis at Ipswich." ca. 1662-63. Suppressed grieving mood similar to that of "Lucasia, Rosania, and Orinda parting at a Fountain" (see No. B.32 above). Slow anapestic stanzas. Pastora and Phillis exemplify constant friendship; Orinda and Lucasia have only the 'tormenting" "pain of remembering their content." J. Poems to Policrite - Lady Mary Butler Cavendish, later Countess of Devonshire. 1. Mambretti. "To The Right Honorable The Lady Mary Boteler on her marriage to my Lord Cavendish." October 1662.50 As yet no ideal name; graceful distant epithalamion; an occasion to celebrate Lady Cavendish's family. Reprinted by Thomas, Collected Poems as "To the Lady Mary Butler at her marriage with the Lord Cavendish, October 1662, I:250. J (I). Poem to Policrite's father. 1. No. 103, pp. 591-592. "To my Lord Duke of Ormond, upon the late Plot." May 1663.52 Graceful public panegyric in the manner of Orinda's Stuart poems; she praises Ormond's many virtues, particularly his loyalty to the Stuarts during the Commonwealth. K. Poem to Mrs. E. Hering. - unidentified woman. 1. No. 67, pp. 565-66. "In Memory of Mrs. E.Hering" Elegy which takes the form of an idealized verse character of a woman who valued private life and lived within herselfe "thy mind was to thee both a shelter and retreat." L. Poems to husband, children and self. 1. No. 54, p. 551-52. "To my dearest Antenor, on his parting." ca. 1652-54. Highly conceited Donnian style; poetry of neoplatonic society period. Orinda asserts an unshakable sympathy between herself and Antenor. 2. No. 10l. pp. 590-91. "On the death of my first and dearest childe, Hector Philipps, borne the 23d of Aprill, and dyd'd the 2nd of May 1655. set by Mr Lawes" ["Orinda upon little Hector Philips" in Saintsbury}. Seven years after marriage death of new-born baby boy, Plangent elegaic quatrains. 3. No. 88, p. 582. EPITAPH. ON HECTOR PHILIPS ["Epitaph on her Son H.P" in Saintsbury"]. 1655. Fine in Ben Jonson's manner. Trochaic octosyllabic couplets like the above. It probably ought to be an anthology favorite. 4. No. 33, p. 535. "To Antenor on a paper of mine wch J.Jones threatens to publish to his prejudice." 1655. See Lucasia poem, No. B.19 above. Good forceful contemptuous tone; heroic couplets. Colonel Jones "below a poet's curse; she can only wish "Let him be still himself, and let him live." 5. No, 94, p. 587. "On the 1. of January, 1657." Her twenty-sixth birthday; she looks back on her life to observe men in the world destroying themselves for vain-glory. 6. No. 30, pp. 530-31. "In memory of F. P. who dyed at Acton 24 May. 1660 -- 13th of her age" ("In Memory of F.P. who died at Acton, 24 May, 1660, at Twelve and an Half of Age" in Saintsburgy)." Consummate elegy (reprinted above). 7. No. 99, p. 589. "To my Antenorg March 16, 1661/2. "60 One of her best unsentimental poems (discussed and reprinted above). M. Poems to More Distant Kin. 1. No. 110, p. 595. "Epitaph on my truly honoured Publius Scipio." 1660. Mother's third husband, Philip Skippon (discussed above). A subtle and sympathetic portrait of a puritan: "Anxious of nothing but an inward spot." 2. No. 82, pp. 578-79. "EPITAPH. On my honoured Mother in Law: Mrs. Philips of Portheynpn in Cardigan=-shire. who dy'd Jan: 1.Ao 1662/3." Idealized verse character of sober woman; a Roman tone: "Reader, stay it is but just . . . "
3. No. 20, pp. 522-23. "To my dear Sister Mrs. C.P. on her nuptialls." 1663. Katherine's half-sister; child of mother's second marriage called Cassandra, possibly a poetic name. A sincere epithalamion in which she wishes the couple content in things of the mind. N. Impersonal poems of renunciation. 1. No. 47, pp. 546-47. "Against Pleasure. Set by Dr. Coleman." 1655. Unusual poem for neoplatonic group because in an incisive only slightly allegorical style, she insists on disillusion. A tone of rankling bitterness: ""Tis all a cheat." 2. No. 81, p. 578. "Song. "To my Lord Biron's tune of -- Adieu Phillis". (In Saintsbury: "Song: 'Tis true our life is but a long disease)." 1655. Another despairing dittie for the poetic circle. Mood of pique: "Hopes crost/object lost." 3. No. 96, pp. 587-88, "Against Love." ca. 1662-630. A Pindaric (discussed above). 0 Moral verse essays.. (Except for octosyllabic and allegorical "The Irish Greyhound, all are highly prosaic mediations in heroic couplets whose stylistic modulation is discussed above. 1. No. 44, pp. 542-43, "On Controversies in Religion." Civil War period. Religion is "not our practice, but our quarrel now." 2. No. 71, p. 569. -12 Cor. V.19. God was in Christ reconciling the World to Himself." Civil War Period. 8to Aprilis 1653. (King still alive). She resolves to "imitate" God by "enlarging" her sympathy when all around her are "narrow souls." 3. No. 90, p. 583. "The Virgin." 1650-60. A fragment; unfinished "Character" in the manner first popularized by Overbury. 4. No. 60 pp. 556-18. "La Grandeur d'esprit" ("A Resvery" in Saintsburgy). Commonwealth. Ironic bleak discourse (quoted above) which reveals Katherine's pessimistic and sceptical outlook towards politics and power in public life. "Power and Greatness" are "golden slavery." She sums up the war thus: "some for Consciencep some for Honour die/And some are meanly killld they know not why." 5. No. 61, p. 558. "A Countrey Life." Commonwealth. Katherine Philips in Wales writes a Golden Age poem. She compares the "felicity" of her "solitude', to "vanity" of "the Spring- Garden show" (a popular Commonwealth pleasure grounds in London). 6. No. 48, pp. 547-48. "God" ("A Prayer" in Saintsbury). Late Commonwealth. She seeks a conversion experience. There are passages of great beauty in this poem; e.g., the world is thus described: "Such shaddows are produc'd by the moonebeams/Of Trees or houses, on the running streams." She prays "that I may heare the God within me speak"/When with a Silent and retired art/Shall I with all this empty hurry part?" 7. No. 70, pp. 567-69. "Submission." 1659-60. Commonwealth crumbling; she resolves to face humbling "Vicissitudes." 8. No. 75, p. 574. "Death." 1659-60. She writes of the self-destruction of the Commonwealth: it died "sadly" "From traitors in their bosom bred." Companion piece to poem to Antenor against despair and wishing for death (see No. L. 7 above). 9. No. 73, pp. 571-72. "The Soul." After 1660. Descartes-like subtle reasoning on new popular scepticism towards religion. Shows remarkable learning for woman of her period. 11. No. 72, pp. 569-71. "The World." After 1660. The finest of Katherine's moral essays, quoted and discussed above. 13. No. 86, Pp. 580-81. "On the Welch Language." 1663-64. Written during Katherine's last sojourn in Wales. Humorous discussion of latest theories on bards, Merling King Arthur, and Roman Britain and Wales. IV. Poems to Men Friends. P. Poems on Poetry, Arts and Privacy. 1. No. 51, p. 549. "In Memory of Mr. Cartwright." 1651. Written in imitation of Cartwright. His poetry "splendid"; the "benighted Times" are "not fit" for such "raptures." 2. No. 21, p. 523. "To Mr. Henry Vaughang Silurist, on his Poems." 1652-55. Fine poem quoted and discussed above. 3 No. 24, pp. 525-26. ."To Mr. J.B. the noble Cratander, upon a Composition of his which he was not willing to own publiquely." 1654-55. Cratander was John Birkenhead, a minor neoplatic poet.55 Orinda praises his morals and art; she thinks he must publish "t'uphold the credit and the beauty of the old." She disliked puritan ascetism and iconoclasm. 5. No. 77, pp. 575-78. "An ode upon retirement, made upon ocasion of Mr Cowley's on that subject ("Upon Abraham Cowley's Retirement Ode" in Saintsbury). 1663. A Pindaric; an occasion for lyrical expatiation on the value of a private "quiet and a cool retreat" to a "safe and solid shore." 6. No. 91, pp. 583-84, "Upon the engracing K:P: on a Tree in the short talke at Barn=Elms" ("Upon the Graving of her Name upon a Tree in Barn-Elms Walks" in Saintsbury). 1663. Gently humorous octosyllabic couplets commemorating a visit she made to Cowley's retreat. Q. Poems on Friendship and Love. 1. No. 52, p. 549. "On Mr. Francis Finch (the Excellent Palemon). 1651-52. Finch a "redeemer" of friendship (discussed above). 2. No. 14, pp. 517-18. "To the truly noble Sir Ed:[ward] Dering (the worthy Silvander) on his dream and navy, [In Saintsburgy: "personating Orinda's preferring Rosania before Solomon's Traffic to Ophir"]). 1652-54. Ardelia's husband (see No. D.1 above),57 Neoplatonic discourse upon a dream. 4. No. 12, pp. 515-16. "To the Noble Palaemon, on his incomparable Discourse on Friendship." After 1656. Souers doubts Gosse's assumption that Palaemon in this poem is Jeremy Taylor -- who published a long general discourse on friendship in his "golden" style to Mrs. Philips. Hiscock found an obscure letter on friendship from Finch (also called Palaemong see No. Q.1 above) to Lucasia and suggests that Gosse was wrong.59 A disinterested reading of Orinda's description of an exalted discourse does not preclude Taylor's essay. She would have been very proud to have had it addressed to her. R. Poems of the Civil War and Commonwealth. 1. No. Il, P. 515. "On the 3rd of September 1651." Effective poem on tragedy of war (discussed above). 2. No. 1, p. 507. "Upon the double murther of K. Charles, in answer to a libellous rime made by Vavasour Powell. ', 1653. Vigorous indignant poem (discussed above). S. Poems of the Restoration. 1. No. 2, pp. 507-8, "On the numerouse accesse of the English to waite upon the King in Flanders." May 1660. Humorous description of King's sudden magnetic appeal: "So till thou come we shall unpeopled be." 2. No. 3, pp. 508-9. "Arion on a Dolphin, to his Majestie at his passadge [sic] into England." May 1660. Idealizing verse character and history of Charles II's travels, hopefully self-fulfilling (and self-serving) prophecy and praise of his "mercy" extended to all. 4. No. 7, pp. 511-12. "The Princess royall's Return into England." October 1660. Fulsome politic poem. 5. No. 6, pp. 510-11. "To the Queen[-Mother's] majestie Jan 1. 1661." Queen Henrietta leaving for France; firm sincere tone when praising Queen's endurance of hardship and loyalty to Charles I. 6. No. 4, pp. 509-10. "On the Fair Weather just at the Coronation, it having rained immediately before and after." April 1660. Light-hearted poem in her best ingenious manner; sparkling memorable conceit at center of poem is often quoted in secondary histories of the period. 7. Mambretti, "On the Coronation." April 1660.60 Companion to above poem; tells story of oak. Thomas prints this in the back of his series of poems, Collected Works, I, No. 124, p. 249. 8. No. 10, pp. 514-15. "On the Death of the Queen of Bohemia." February 1662. Graceful fluent elegy; real sympathy and admiration (discussed above). 9. No. 9, pp. 513-14. "To her royall highnesse, the Duchesse of Yorke, on her command to send her some things that I had wrote." April 1662. Awkward overdone panegyric. 10. No. 5, pp. 509-11. "To the Queene on her arrivall at Portsmouth. May. 1662" ("To Queen's Majesty on her Arrival at Portsmouth, May 14, 1662" in Saintsbury). Sometimes forced, but includes passages of real lyric grace. 11. No. 76, Pp. 574-75. "To Queen's Majesty, on her late Sickness and Recovery." Much like the above, with the difference that this is a poem in praise of Charles II, making known his real distress at his Portuguese queen's sudden frightening seizure. I On William Cartwright as a "cherished" Cavalier playwright, see Alfred Harbage, Cavalier Drama (London: Oxford Univ. Press, 1936), pp. 141-44. See also John Broadbent,ed., Poets of the 17th Century, 2 vols. (New York: Signet, 1974). II, 264- 69. Broadbent's two-volume anthology remains one of the best ever made of 17th century poetry. 2 George Saintsbury, ed., Minor Poets of the Caroline Period, 3 vols. (Londont Oxford University Press, 1905), III, 487-612. Saintsbury improved on Cotterell by numbering Philips's poems. For the convenience of the reader I cited both numbers and pages of the poems in my text; Thomas used Saintsbury's numbers. 3 This phrase is Philips's for the papers that had escaped her; see her letter to Poliarchus dated January 29, 1663/4 (included by Cotterell as a "Preface', in his edition). Saintsbury, III, 491. 4 See. for example, Lillian Faderman, Surpassing the Love of Men: Romantic Love and Friendship between Women from the Renaissance to the Present (New York: William Morrow, 1981), p. 69. 5 Julia Longe,Martha, Lady Giffard, Her Life and Correspondence, 1664- 1722 (London, 1911). pp. 38-42. 6 Paul Elment "Some Manuscript Poems by the Matchless Orinda," ER, 30 (1951), 53-71; Louise I, Guiney, ed. The Orinda Booklets, No. I (Cottingham, near Hull, 1904). 7 Mary R. Mahl and Helene Koon, The Female Spectator: English Women Writers Before 1800 (Bloomington: Indiana Univ. Presse 1977), pp, 157-59; Catherine Cole Mambretti, "Fugitive Papers: On A New Orinda Poem and Problems in Her Canon", Pap Bibl Soc Am, 71 (1977), 443-52. 8 Edmund Gosse. "The Matchless Orinda," Seventeenth-Century Studies (London, 1883), pp. 205-26; Philip Souers, The Matchless Orinda (Cambridge: Harvard Univ. Presso,1931). Philips's first biographer was John Aubrey, who interviewed several people intimate with her; see also Myra Reynolds, The Learned Ladv in England, 1650-1760 (New York: Houghton Mifflin, 1920), pp. 55-9. 9 Edmund Gosse, Jeremy Taylor (New York: Macmillan, 1904). particularly pp. 127, 138-44; W. G. Hiscock, "Friendship: Francis Finch's Discourse and the Circle of the Matchless Orinda," RES, 15 (1939), 466-68; W. Roberts, "Sir William Temple on Orinda's Neglected Publications," Pap Bibl Soc Am, 57 (1963), 328-36; Thomas Patrick, "Orinda, Vaughan and Watkyn: Anglo-Welsh Literary Relationships During the Interregnum," AWR, 56 (1976), 96-102. 10 W. Roberts, "Saint-Amant, Orinda, and Dryden's Miscellany," ELN, 1 (1963-64), 191-96; and "The Dating of Orinda's French Translations," PQ, 49 (1970), 56-67. See also Russell K. Alspach, "The Matchless Orinda," MLNE, 52 (1937), 116-17. Alspach quotes the derogatory remarks in Newcomb's "Biblioteca." 13 Broadbentt II: 221-22. See also Arthur Nason, James Shirley, Dramatist (New York: Nason, 1915). pp. 148-50. 14 Souers, pp. 8-18, 256-77. 15 W. Roberts, "Saint-Amant, Orinda, and Dryden's Miscellany," ELN, 196; Souers, pp. 145-47, 196-209. 17 See Betty Travitsky, ed. The Paradise of Women Writings: Englishwomen of the Renaissance (Connecticut: Greenwood Press, 1981), pp. 13t 115- 17, 216 (onJoanna Lumley, Lady Fitzalan's and Lady Mary Sidney Herbert, the Countess of Pembroke's translated plays). It is a great shame this book reprints so many women in such small porportions so that effect often is to have many disconnected scraps which exemplify rather than explode a number of stereotypes. It is very useful as a bibliography. 18 The "golden age" of romantic friendship" between learned women was the eighteenth century; Orinda was a new phenomenon in the mid-seventeenth; see Faderman, pp. 75-143o See also Gosse, "The Matchless Orinda," pp. 208-ll, 214. 19 See Broadbent, II, 346; Vivian de Sola Pinto, ed., Poetry of the Restoration, 1653-1700 (New Yorki Barnes and Noble, 1966), pp. 48-50; Ann Stanford, The Women Poets in English (New York: McGraw-Hill, 1972), pp. 59-63. 20 See W. H, Auden on Shakespeare's sonnets, 'Introduction" to The Sonnets ed. W. Burto (New Yorkt Signet, 1964), pp. xxix-xxxii. 21 See Broadbent's comments, II:317; also Souers, who attributes her misery wholly to her husband's fall from power; Souers, pp. 105-99. 23 Souers, p. 98. See also pp. 89-92. Katherine had a second daughter of her ownt,another Katherine, whom Gosse thought was called Joan, and to whom he wrongly attributed the poems of Ephelia (still unidentified). Despite Souers, the attribution is still made. See Gosse, "The Matchless Orinda," pp. 228-29; Reynolds, pp. 138-39; and Stanford, pp. 66-7. 24 Souers, pp. 89-91. Another extremely affectionate mother of the period was Alice Thornton. See The Autobiography of Mrs. Alice Thornton, ed. Charles Jackson (Yorks Surtees Society, 1873), pp. 91-3. 96-8, 107ff., et passim. We do not know about the average woman's love for her children because she could not write; see Antonia Fraser, The Weaker Vessel (New York: Knopf, 1984), pp. 73ff. 25 It would not be inappropriate to place Katherine's translation of St. Amant's "La Solitude" with these poems as it is self-communing, and it rehearses in a more fanciful or symbolic mode than is usual with Orinda the same retreat from society. On the symbolism of this poem, see J. P. Hill and E. Caracciolo-Trejo, Baroque Poetry (London: Dent, 1975), pp. 1-4, 33-419 46-60. 28 Mahl and Koon are the single exception. They reprint "To Mr. Henry Vaughang Silurist, on his Poems" and "To Mr, Henry Lawes" in lieu of the usual Lucasia and Rosania poems. They also reprint Orinda's letter of January 29, 1663/4 to Poliarchus; it is an apology for her poetry. See pp. 16off. 29 On the pseudoknowledge and pejorative categories with which modern psychoanalysis has burdened female friendships, see Faderman, pp. 15-209 239ff. Broadbent accuses Orinda of "bitchery" in her lesbianismo" II::317. Feminist scholars also select Orinda's love poems, valuing her because she offered "female love, affection and friendship a concrete and expressive literary shape"; see Moira Fergussson, ed., The First Feminists: British Women Writers, 1578-1799 (Bloomingtoni Indiana Univ. Press, 1985), pp. 104-13. 30 Souers, pp. 58-78t 182-83, 242ff., et passim; Thomas pp. 97ff., Gosse, Jeremy Taylor, pp. 139ff. ; Reynolds, pp. 55-9, 150-51 (the last is a comparison of Philips's success among the wits and in society with Anne Kingsmill Finh, the Countess of Winchilsea's comparative failure). 31 See Hilda L. Smith, Reason's Disciples: Seventeenth-Century English Feminists (Urbana: Univ. of Chicago Press, 1982), pp. 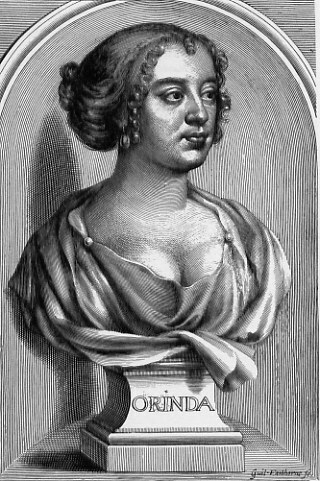 20-66, 75-95, Aphra Johnson Behn was also "incomparable in this period and for some of the same reasons as Philips. On Behn's education.,see Angeline Goreau, Reconstructing Aphra (New York: Dial, 1980), pp. 24-32. 32 I correct the Cotterell-Saintsbury text (whichread,"Leon's" hill) by an early suviving manuscript; see Thomas, p. 98. 33 Smith's denigrating discussion is typical, pp. 153-54. One should note that in Smith's really superior book, one finds the common error of identifying Policrite with Margaret Lucas Cavendish, Duchess of Newcaste. Souers and Mambretti argue that Policrite was Lady Mary Butler Cavendish, the Duke of Ormonde's daughter. Like the identification of Ephelia with Katherine Philips's daughter. this fiction of a friendship between Orinda and the Duchess is found in a number of books on the seventeenth century, including a good contemporary biography of the Duchess of Newcastle, Douglas Grant's Margaret the First (Toronto: Univ. of Toronto Press, 195?). pp. 216-17. Another whipping girl use of Orinda can be found in Nancy Cotton, Women Playwrights in England, c. 1361-1750 (Lewisburg: Bucknell Univ. Press. 1980), pp. 195-98 especially. 35 Ibid., p. 256. Souers argues that Philips was Cartwright's disciple, but although she takes two poetic names from Cartwright's plays, she is also influenced by a large circle of seventeenth-century male and female English and French poets. 36 Mahl and Koon, pp. 157-59. 37 Cf. Broadbent, II:266; Harbage, pp. 133-34. See also Souers, pp. 57ff. 39 Souers, pp. 36 and 275. 41 Ibid., p. 109. Souers writes: "For seventy lines she displays the convulsions of her disappointed heart in couplets overflowing with emotion more real and spontaneous and passionate than any of the other poems of this time." 46 Gosse, Jeremv Taylor, p. 127. 49 Charlotte Fell Smith reprints much of the diary of this interesting educated court lady in Mary Rich, Countess of Warwick, 1625-7: Her Family and Friends (London: 1901). 54 Denham's use of the stag to represent Thomas Wentworth, the first Earl of Strafford was well known; but Orinda's more generalized allegory and humanizing of the animals of the hunt rather resembles the Duchess's poem, of which, among others, Waller was notably jealous. See Margaret Lucas Cavendish, Duchess of Newcastle, Poems and Fancies (1653; rpt. Yorkshire: Scholar Press, 1972), pp. 110-16. 57 Ibid., pp. 44t 59, 60, 65ff. 58 Thomas, p, 100. On Philaster, see also Souers, pp. 83, 156, 170t 181, and Regina poems discussed above. 59 Souers, p. 64, Gosse. Jeremy Taylor, pp. 12ff., Hiscock, p. 466. 61 Gosse, Jeremy Taylor, pp. 12, 202. Since I wrote this essay, in her "Two Poems and A Prose Receipt: The Unpublished Juvenalia of Katherine Philips," ELR, 16 (1985), 383-90, Claudia Limbert printed two more "new" (Iiitherto unknown) poems by Philips, ca. 1646-48. In these an unmarried "C.Fowler" writes to her neighbor, an unmarried Welshwoman, Mrs. Anne Barlow. These poems form a new subgroup in my first group, and they should be placed between D and E, between the Ardelia and Philoclea poems. Limbert states that after she found the poems in the uncatalogued Orielton Collection of the National Library of Wales,she found that she had been anticipated by Ronald Lockley, Orielton: The Human and Natural History of a Welsh Manor (London, 1977), pp. 19-20, and by an unpublished Ph.D. dissertation by Patrick Thomas, "An Edition of the Poems and -Letters of Katherine Philips, 1632-1664," Diss. Univ. of Wales, 1982. However, Limbert is the first to identify Philoclea by means of Philips's copybook, NLW 775B, p. 37," as another unmarried Welshwoman, Mrs Mallet Stedman whose sister-in-law married Katlierine's husband's brother. Thomas's Nos. 141, Vol I, pp. 241-42: "To the Right Honourable the Countess of Cork". This is second poem to H (1), No 1 above; it can be profitably read alongside "To the Rt Hono: the Lady E. C. ("Madam, I do not write to you that men may know/How much I'm honour'd that I may do so"). The Countess was (as stated above) mother to Celimena (Lady Elizabeth Boyle Tufton, Countess of Thanet) and Valeria (Lady Anne Boyle Montagu, later Lady Sandwich) and she encouraged Katherine to write poetry. Hence the real warmth, gratitude and length of this epistle. Thomas's Nos. 118 through 122, Vol I, pp. 242-251, are comprised of original Songs from Katherine's translation of Corneille's Pompey: Song from Pompey, Act I: "Since affairs of the State are already decreed ..."; Act II: "See how Victorious Caesar's Pride; Act III: "From lasting and unclouded Day"; Act IV: "Proud Monuments of Royal Dust! "; Act V: "Ascend a Throne, Great Queen! to you ..."
Thomas's No. 126, Vol 1, pp. 251-52, "To Sir Amorous La Foole," adds a poem to someone caricatured as an egregious "unmanly" or effeminate fop. Thomas's No. 127, Vol I, pp. 253-53, "Juliana and Amaranta, a Dialogue" is another poem to women friends which would presumably go with Katherine's poems to "minor" women, women who were only passing not intensely important friends to her. Thomas's No. 128, "On Argalus his vindication to Rosania, is a short poem which belongs to the set to Rosania (Mrs Mary Aubrey Montagu). Again Katherine has recourse to names from Philip Sidney's Arcadia. Thomas's No. 129 , "No blooming youth" is the first of two poems labelled "Juvenilia." Tho they desemble [sic] their misfortunes well. It's allways happy as it's innocent. Few worldly crosses to distract your prayers. Attend on matrymony and a husband too. Turn, turn apostate to Love's Levity. There' s no such thing as leading Apres in Hell. Thomas's Nos. 131 - 133 are printed as "poems of doubtful authenticity." I have printed the first, Thomas's No. 131, Vol I, pp. 254-56, as by Katherine, see above No.B13, which I took from Mahl and Koon, "To Rosania & Lucasia. Articles of Friendship. Thomas's No. 132, Vol I, pp. 256-57, "Upon his Majesties most happy restauration to his Royall Throne in Brittaine," "Awake Brtiiannia, rouse thy selfe, and say". If this is by Katherine, it belongs with the Stuart poems. Thomas's No. 133, "Upon the Hollow Tree unto which his Majestie escaped after the unfortunate Battell at Worcester", "Haile aged Tree! Jove keep thee from all harmes ...". This is another Stuart poem. Doubtless Cotterell would have put it early in the arrangement had he know of the text. Claudia Limbert also submitted an important essay to Philological Quarterly, "The Poetry of Katherine Philips: Holographs, Manuscripts,and Early Printed Texts" which I read as one of its reviewers and strongly recommended for publication in the periodical. It was subsequently published by PQ. The reader today must also read the essays and commentary on Katherine Philips particularly as published by Carol Barash in her English Women's Poetry, 1649-1714: Politics Community, and Linguistic Authority (New York: Oxford University Press, 1996); by Isobel Grundy and Susan Wiseman, edd., Women, Writing, and History, 1640-1720 (Athens: University of Georgia Press, 1992); and Margaret J. M. Ezell's study, Writing Women's Literary History. Baltimore and London: The Johns Hopkins University Press, 1993. There have been other smaller pieces and commentary on Philips and the women poets of her era in various books, and there are some older ones which are not cited above (Dorothea Canfield Fisher, Corneille and Racine in England [New York: Macmillan, 1940]). These include Lucy Brashear, "The Forgotten Legacy of the 'Matchless Orinda,'" Anglo-Welch Review, 65 (1979), pp. 68-76; Harriette Andreadis, "The Sapphic-Platonics of Katherine Philips, 1632-1664," Signs: Journal of Women in Culture and Society, 15:11 (1989), 34-60; . However,the above three books are the most important recent ones and themselves contain excellent bibliographies.